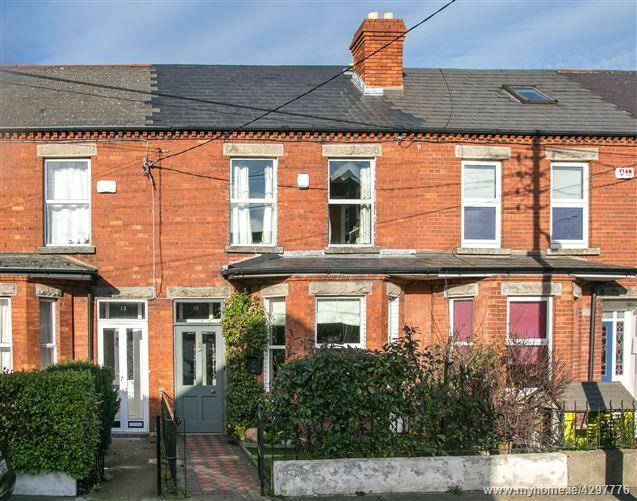 DNG are delighted to represent the sale of 14 Brighton Gardens, a beautiful red brick fronted residence ideally located only a short stroll from both Terenure and Rathgar villages. This property is presented in immaculate condition throughout and benefits from a spacious attic conversion with the added bonus of a shower room. 14 Brighton Gardens boasts light filled accommodation, complemented by an openplan living layout ideal for modern family living. This property has a real sense of character and charm with original features such as high ceilings, bay windowed living room and fireplaces. Viewing comes highly recommended to appreciate this stunning home located on a most popular road. Accommodation downstairs comprises of a porch, spacious openplan living/dining room with bay window and a bright kitchen/diner to the rear. Upstairs are 2 Bedrooms with the master bedroom benefiting from an ensuite shower room and the bathroom is situated on the return. The attic has now been converted to another large room and a shower room. The rear garden is fully landscaped with double french doors leading to the dining room and living room with pedestrian rear access to the rear of the garden. Tucked away in this highly sought after area, Brighton Gardens enjoys an extremely convenient setting beside Terenure and Rathgar village. Terenure village with its wide array of shops, restaurants and bars is on the doorstep whilst Rathgar village is less than a 5 min walk, there are host of primary & secondary schools, bus routes, parks, sports facilities etc. The M50 and city centre are also within easy reach. Bright and spacious living/dining room incorporating a modern openplan layout yet still boasting original features such as a bay window, open fireplace, 9ft high ceilings and centre roses. Double doors lead from the dining area to the garden and there is an opening to the kitchen. See our online map for accurate location or contact DNG on 01-4909000 and we would be happy to assist.